If you’re a brick and mortar health club, fitness business, medical practice or wellness center, cultivating your Google My Business local listing like it’s a precious flower is the single most important SEO strategy available to you. Traditional tactics like backlinks and citations while still valuable are also becoming less and less important. It’s a mini-ecosystem that includes strategic owner-posted & answered Q&A, GMB-specific posts and special offers, imagery and video, review and recommendation strategies and much more. If you do nothing else, make this your priority. This lead strategy often generates much higher opt-in and response rates than the traditional email lead-magnet sign-up approach. It’s not surprising, really. Email has issues, right? It often just doesn’t get read — at least, not quickly enough to do any good. Further, current versions of desktop clients like Outlook and browser clients like Gmail tend to shove promotional emails into a corner where they get less attention. And that’s on top of the legitimate opt-in emails that get automatically junked anyway. Want to push a last-minute reminder about your January new-member promotion or your wellness center’s open house tonight? We’ve told nearly all of our clients that they need to implement chat on their websites. 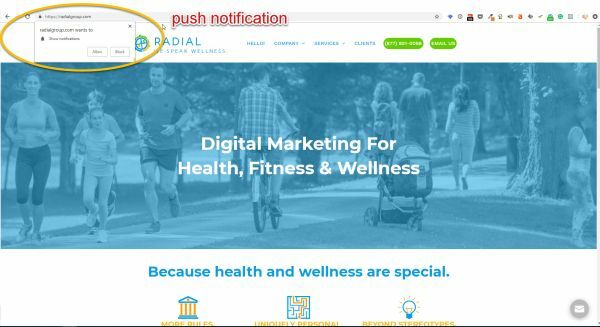 Whether it’s weight loss programs, sports conditioning, women’s health services, yoga classes or corporate and employee wellness platforms, your site visitors want chat. These are potential customers we’re talking about, so make it easy for them to start the conversation! We like the Comm100 tool — lots of options, reasonably priced and the app is solid. It’s what we’re using on our own site right now. We don’t like PureChat — we know the price is right but clients have told us the app is rocky and the reporting is super-minimal and doesn’t play nicely with Google Tag Manager. Just remember — take the time to go through all the configuration steps and truly customize it to your pictures — assigned chat responsibilities on your staff so the chats get answered during “live” hours, updated logos, appropriate titles and photos for whoever chats with visitors, appropriate custom vocabularies for the standard prompts and so on. Marketing messages delivered via Facebook Messenger let you deliver high-visibility messages that typically get attention within seconds or minutes. While users under age 55 are pulling away from the vitriol that clogs up their Facebook newsfeeds, they’re spending more time in Messenger where they can chat 1:1 or small curated groups tailored to specific conversions. That makes it a natural destination for 1:1 marketing for many of our health and wellness clients. It’s definitely worth adding to your marketing plans in 2019. Plain ‘ol keywords aren’t what they used to be. Google and Bing are smart enough these days to think in terms of content clusters. Yes, “voice search” is a thing. 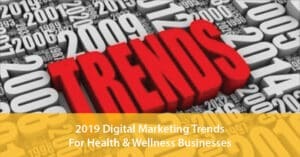 But the truth is that other than basic Google searches, voice just isn’t a major issue for most health and wellness businesses — at least not in 2019. We’ll keep you posted as this evolves, but since you can’t do everything — scratch this one off your list for now. Whew! Sales and service chatbots can be great, when they’re well implemented in the context of your business. But unless you’re a fairly large company, or deal with lots of small transactions, like nutrition supplement sales or weight loss app sales, your team’s probably not going to do a great job of setting it up. It’ll cost you leads that might well have become customers if you had stuck to your knitting. Our suggestion: make minimal/no use of chatbots (even though Hubspot really pushes it!) and make your plain-vanilla chat experience a home run for your site’s visitors for 2019. Pretend you never heard of it. Yes, the technology has marketing applications — which are just bright shiny objects at the moment that will distract you from far more effective strategies.